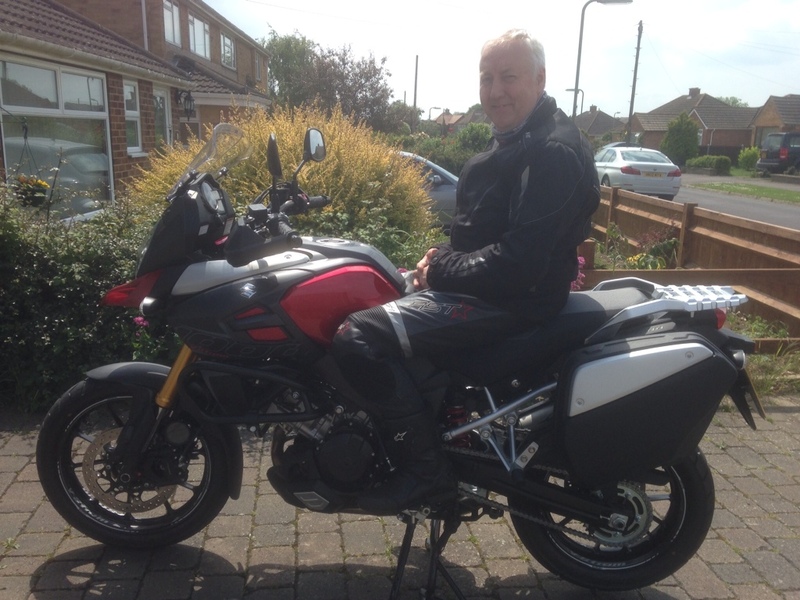 Last weekend, I booked a test ride on a Suzuki V-Strom 1000DL as I thought it was about time I changed my bike. The last 4 years I have owned a Suzuki GSF 650SA ABS K9 Bandit and I have loved every minute of riding her. However, as the years take their toll, although the bike was comforatable, after a long period of time on her, my back and knees were feeling the pressure. So last Saturday, I booked a Test Ride with CMW Motorcycles in Chichester, I took the bike out for just over an hour, out via Petworth, Midhurst and back to Chichester. The route is lovely, nice winding roads, with varying speed limits, so I knew I could see how I could handle her. Not having riden a 1000cc bike before, I was concious of her excelleration initially, and being a V twin, found it a completely different experience to the Bandit. The excelleration was fanastic and the sound very throaty, but she pulled away with ease, at low speeds 30 – 40 mph I didnt even venture in to 5th gear, she just cruised along perfectly. When I finally managed to find a piece of road that I could open her up, it was astonishing, the power was great. Being a different seating position to the Bandit it took a while to get used to the cornering, but from 30 up to 70, she took short and long sweeping corners with ease. If anyone could have seen my face under the visor, there was a grin from ear to ear. The bike comes with ABS and three settings for traction control (off, 1 & 2) not that I noticed the control in action. The seating position is comforatble and upright, and if a pillion is with you, they will be well seated also. (time to get the wife onboard). Legs and feet are 90 degress and feet down on the low seat at 5' 10″ you can have the balls of your feet on the ground, of if you slide sideways a full flat foot. There is an option for a higher seat for the taller person, Suzuki at the time of writing are offerin a free swap for the taller seat.